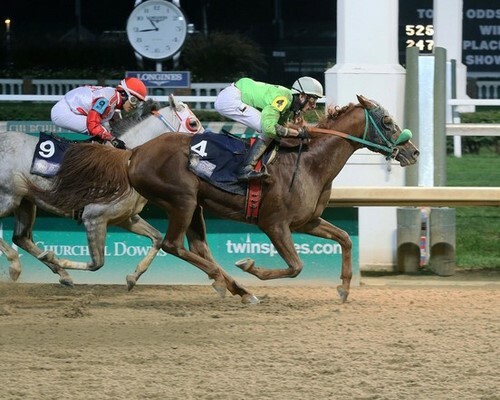 In what is being referenced as the story of the year, Quick And Rich (TH Richie x Quick Noon) overcame both Easter Man and the legendary Paddys Day to win for his owners/breeders, Tom and Joyce Fritz of Sidney, Michigan. The handsome 7 year old chestnut stallion, now boasting a lifetime earnings of $173,964, chased the pace early behind Easter Man and Paddys Day, allowing Thess is Awesome to set the pace in front. It all changed during the stretch run when Paddys Day and Easter Man both made their bid, overcoming a tiring Thess is Awesome. All appearances indicated that it was Easter Man’s day, as he drew clear of Paddys Day. But in the final 1/16 of a mile, Quick And Rich displayed a stunning kick as he swallowed 12 lengths to reach Easter Man in a matter of seconds, edging past the leader in the final stage to take the $100,000 President of the U.A.E. Cup in an extraordinary and breathtaking fashion. In spite of running a game second to Paddys Day just two weeks ago in the H.H. 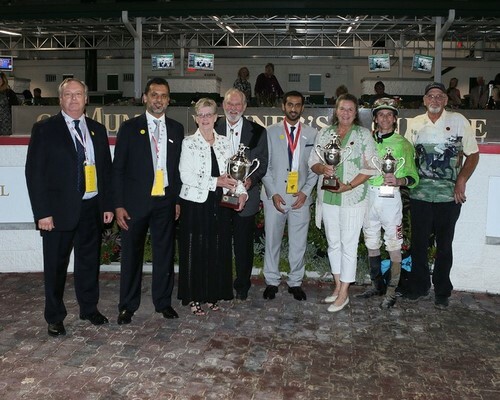 Sheikh Zayed Bin Sultan Al Nahyan Diamond Jewel Stakes at Monmouth Park – earning him an all-expense paid invitation alongside Paddys Day to the H.H. 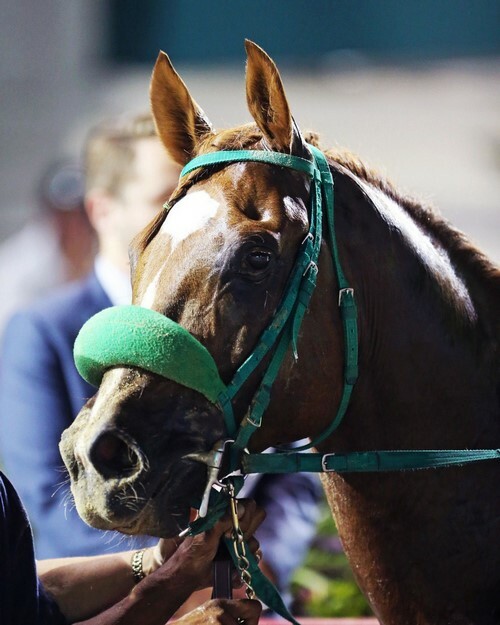 Sheikh Zayed Bin Sultan Al Nahyan Jewel Crown, the world’s richest Arabian horse race, in Abu Dhabi this November, Quick And Rich still left the gate at an underlay of 19-1, paying back $41.20 for the win with a final time of 1:54.39. It was the feel-good story of the year for Tom and Joyce Fritz. Both now retired, the Fritz’s have been supportive of Arabian racing for nearly three decades. Quick And Rich is the final horse from their breeding program that they will run. And he is providing them quite a grand finale, topping the chart as the highest earning horse they have ever bred or owned. The couple is much loved in the Arabian racing community, as is their trainer, East-coast based Lynn Ashby. They came to Churchill Downs never expecting the win, but looking forward to their first trip to the Middle East for the Jewel Crown this November. Winning under the Twin Spires was beyond their wildest dreams. Ashby gave a lot of credit to jockey Joseph Rocco, Jr. for the win. Rocco is one of the leading jockeys at Churchill Downs, and has ridden the earners of over $33 million in purses and won over 1,100 races. He spoke glowingly about Quick And Rich that evening. 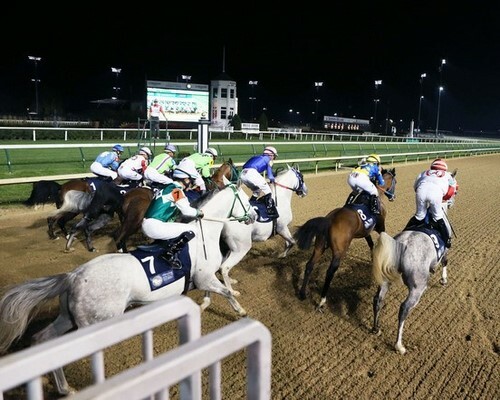 This was the 5th time since 2011 a race for purebred Arabian horses was staged at the world-famous Churchill Downs. The President of the U.A.E. Cup series is the longest running Arabian race series in the world. It began in 1992, and was the first series to visit France, the United Kingdom, Belgium, Holland, Germany, Ireland, Morocco, Egypt, Canada, Switzerland, Sweden, Denmark, Turkey, UAE, Russia and the United States. This race at Churchill Downs marks the 12th time it has been run in America, with plans to return in 2018. To view the race as well as live coverage from the entire day, visit www.Facebook.com/TheAJClub. Then mark your calendars to watch Quick And Rich rematch Paddys Day, alongside a field of the best Arabian racehorses in the world on November 10th for the EUR 1.2 million Jewel Crown, as the Arabian Jockey Club brings you the race live, in addition to behind-the-scenes coverage of the race, the track, the contenders, and the events surrounding the Arabian race of the year. 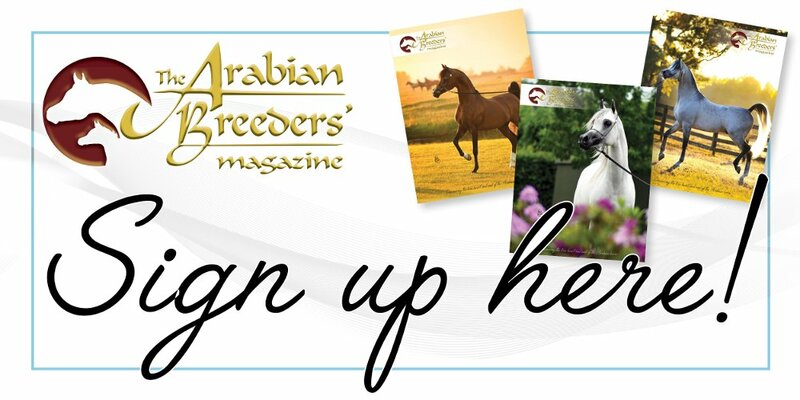 For more information, visit www.ArabianRacing.org.